Wisdom tooth is the third molar that erupts last in the oral cavity, usually after the other 28 teeth have already erupted. And these wisdom teeth come at the age of around 17-21 years and sometimes till 25 years of age. One of the most frequently removed/extracted teeth is the 3rd molar, as they erupt at places other than normal, as there is sometimes less place remaining for the 3rd molar to erupt after the other 28 teeth have come out. Wisdom teeth position is checked with the help of orthopantomogram if it doesn’t erupt, and after the exact position is known, the way of extraction is determined. Abnormal position of 3rd molar is called as impaction. These impacted teeth have no possibility to erupt normally, and surgical extraction of these teeth is the only way to reduce the pain if it occurs, or disturbs the position of the adjacent erupted teeth like the 2nd molar. Why is a wisdom tooth removed? Erupting in an abnormal position, like tilted, sideways or twisted way. Malpositioned adjacent teeth, leading to trauma while chewing/biting of food. 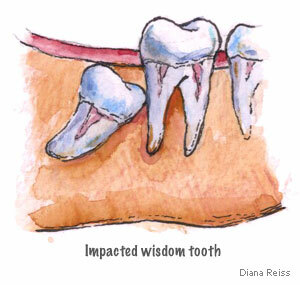 The wisdom tooth fails to erupt due to loss of space for its eruption in normal arch. Tooth decay due to lack of proper care as the tooth is not under the range of normal cleaning habits. Infection from trapped food etc. leading to a condition called Pericoronitis. The oral and maxillofacial surgeons, depending on the level of impacted wisdom tooth, and other factors, decide the extraction procedure.